Carbon "credit cards" could be issued as part of a nationwide carbon rationing scheme, Environment Secretary David Miliband has suggested. 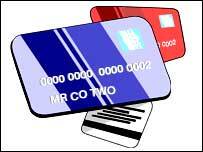 An annual allowance would be allocated, with the card being swiped on various items such as travel, energy or food. 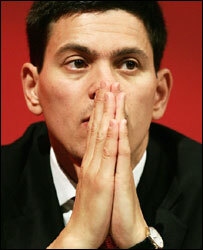 Mr Miliband said people who used less than their allowance could sell any surplus to those who wanted more. A feasibility study says many questions remain on such a plan, but Mr Miliband says "bold thinking" is needed. Mr Miliband told the Guardian that the scheme had "a simplicity and beauty that would reward carbon thrift". Mr Miliband, who commissioned the feasibility study, said the scheme could be working within five years. Individuals and communities had to be empowered to tackle climate change - "the mass mobilising movement of our age". "You cannot just rely on the state," he said. The feasibility study was carried out by the Centre for Sustainable Energy for the Department of the Environment (Defra). It says there are questions over whether a scheme would be acceptable for politicians and the public, but could be fairer than imposing carbon taxes. The report seeks to separate a carbon trading scheme from the proposed ID card scheme, to avoid it being attacked on the same civil liberty basis as identity cards. Defra said the government was now developing a work programme "which should provide the information to lead to a decision on whether or not a personal carbon allowance is a realistic and workable policy option". Mr Miliband predicted the environment would be a key issue in the next election, requiring Labour to "change our policies and our politics in fundamental ways so that we are seen as the change in the next election". "I'm a great believer in the Arsene Wenger school of management - which is, you don't worry about the opposition, you just get your own act together," he said. He insisted that climate change required "cumulative, consistent radicalism" rather than "one shot wonders". Environmental measures in last week's pre-Budget report, including a 1.25p per litre increase in fuel duty and a doubling in air duty, were called "pretty feeble" by green groups. Environmental group Friends of the Earth said the principle of using a limited "budget" of carbon per person was sound, but the implementation - especially as it would involve a government IT project - was a cause for concern. Friends of the Earth climate change campaigner Martin Williams said: "What worries us is that it could take quite a long time to implement it and really we don't have that long to tackle climate change." At a meeting in Downing Street on Monday, the prime minister met business, media and religious leaders to promote "collective action" against climate change. The Bishop of London and the chief executives of B&Q, BSkyB, the Carphone Warehouse, HSBC UK, Man Investments, Marks & Spencer, O2, Starbucks UK, the director general of the BBC and Tesco formed a partnership to publicise "practical, simple solutions". A public campaign will be launched in March 2007. Would you use a carbon 'credit card'?